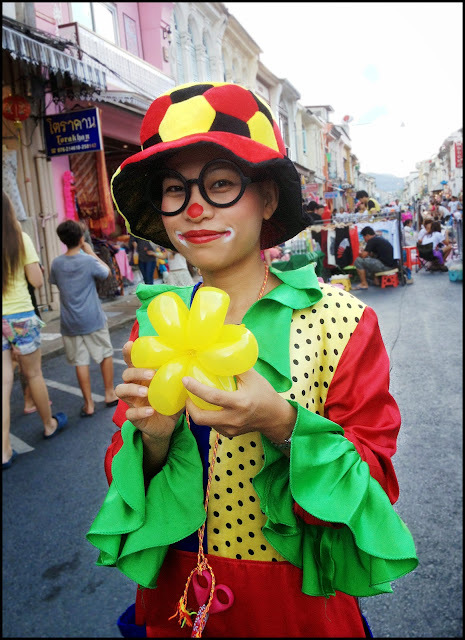 Sunday has always been a quiet day in old Phuket Town. Many businesses close on Sundays and the nightlife is much quieter than Friday or Saturday - the area has plenty of bars and pubs which are mainly frequented by locals rather than tourists. Sunday was always a good day to walk around old town and take photos, as there would be much less traffic than other days, but it did feel a bit too quiet sometimes with many shops and some restaurants closed. The old town has had a renaissance over the last 5 years with a lot of work being done to preserve old buildings and remove ugly overhead wires, museums have opened, and many small cafes too. I'm hoping the area can avoid becoming just cafes and souvenir shops, and so far that is the case. Thalang Road is the heart of the old town and still has many old businesses such as printers, hardware stores, Muslim fabric shops and places like Abdul's Roti shop and the old herb shop. 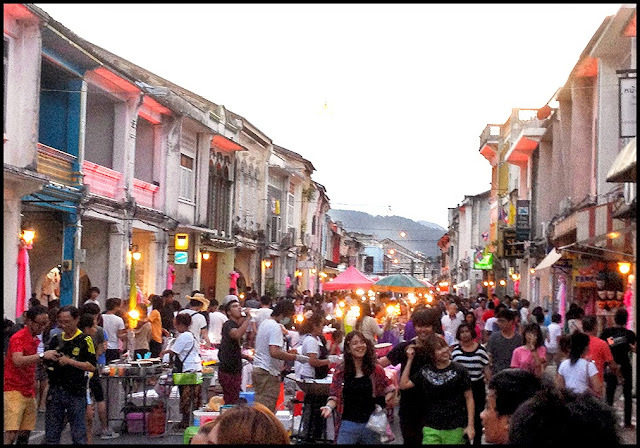 Towards the end of 2013, the Phuket old town community launched the Sunday Walking Street market along Thalang Road. This had been planned for some months and does need support from local government and police, as traffic has to be diverted and all vehicles moved from Thalang Road before the market starts in the afternoon. It's a very popular place for Sunday evenings! 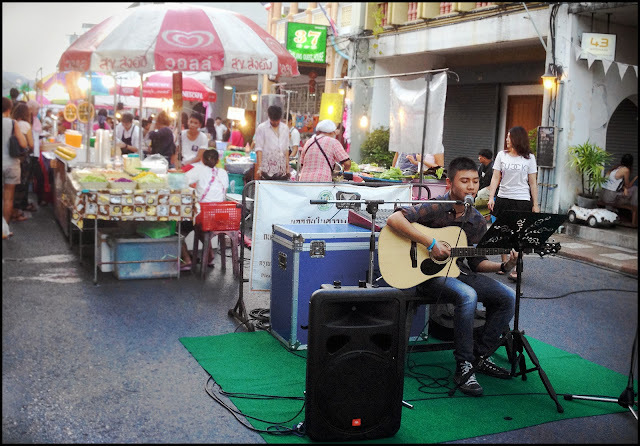 (above) Walking Street along Thalang Road just before dark ... it starts late afternoon around 4pm and continues until about 10pm every Sunday. The ever popular Weekend Night Market is on Saturday and Sunday, and seems to be just as busy despite "competition" from this new market. I think people maybe visit both on a Sunday. 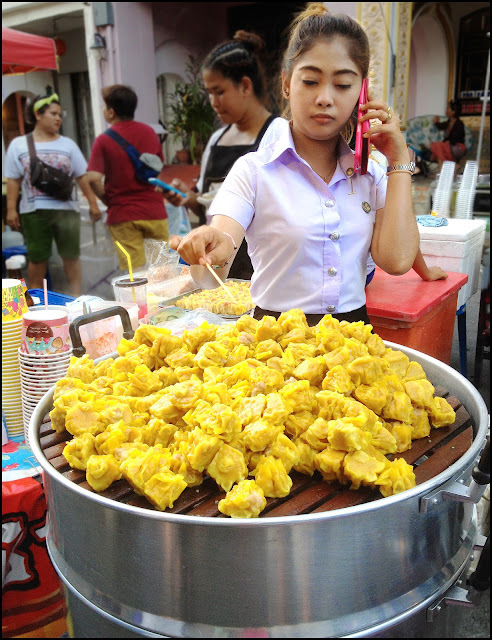 The weekend market is much bigger, but the official name for this Sunday walking street is "Lard Yai" (หลาดใหญ่). 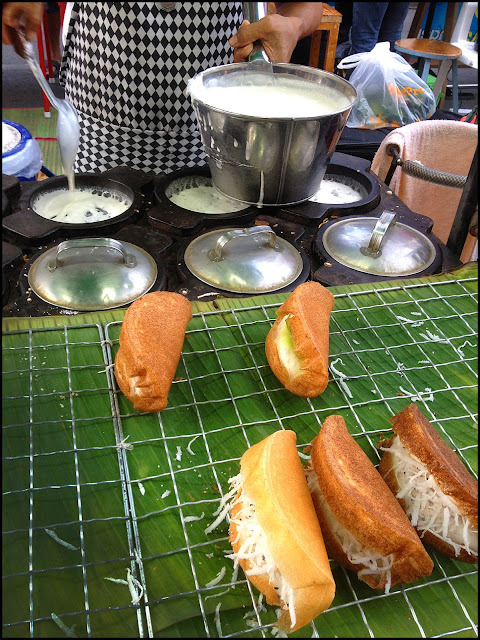 Yai means big, and Lard is a shortened version of Thalad, meaning market, but in the southern Thai dialect, people say "Lad" / "Lard" - hard to exactly transliterate, theres no hard R sound in the word. 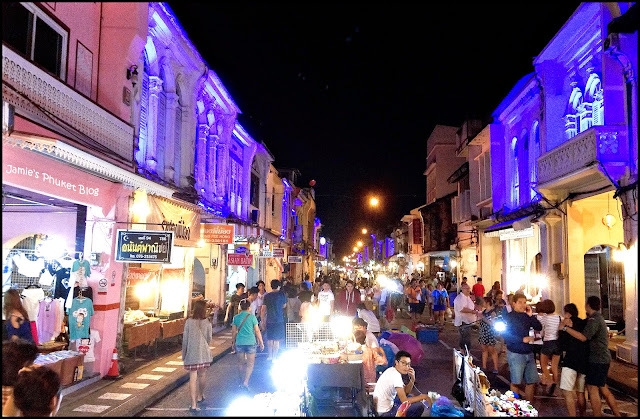 Back in the old days, Thalang Road was the main market street in Phuket town. We go quite often and our Sunday dinner is snacks purchased along the street! It's pretty busy and with Thalang Road itself closed to traffic, and many people visiting the market, parking can be hard to find. We tend to park at Wat Mongkon Minit temple, which is on Dibuk Road just over the street from the north end of Soi Romanee, a narrow old street that leads down to Thalang Road. It's 20 Baht to park the car there. Soi Romanee has had plenty of renovation work in the last 5 years. There are still some old houses here, plus a few cafes and guesthouses. In the tin mining days 100 years ago, this street was apparently full of brothels! There are always street entertainers, some are the same every week and some are strictly amateur or school dance acts. A few weeks ago there was a brass band playing! 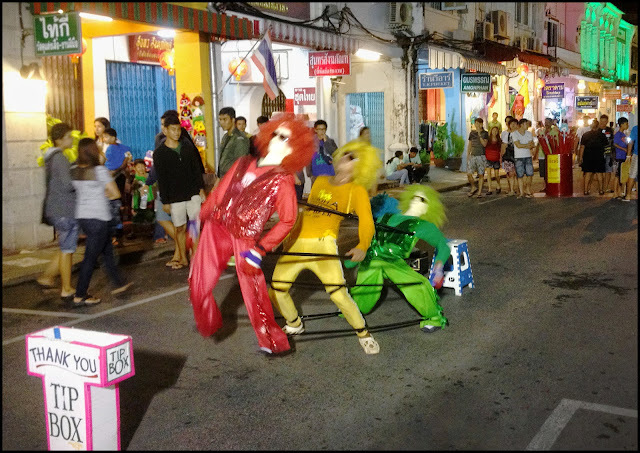 (above) Street dancer on Thalang Road. I see this guy at every street fair and he's very enthusiastic! 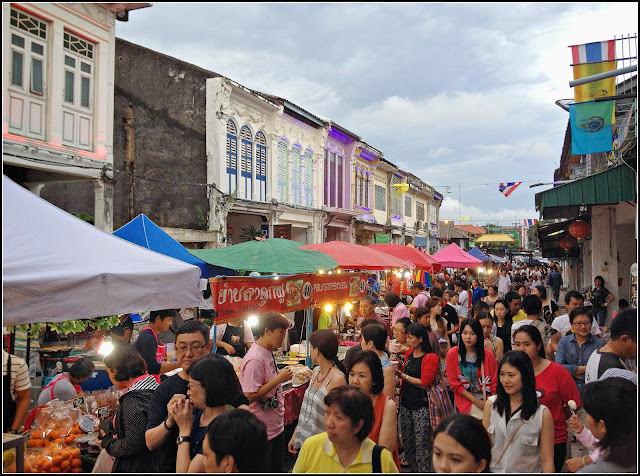 The Lard Yai has become very popular, a place to hang out on Sunday evening for locals, and a good way of showcasing the old town. Not many tourists though .. I know if you're staying on the west coast it's a bit of a drive to reach Phuket Town, but worthwhile! I'm going to keep saying it - there's a lot more to Phuket than beaches!